Scientists studying what is killing starfish from Alaska to Mexico are beginning to put some of the pieces of the puzzle together. They’ve linked warmer ocean temperatures to the devastation of the wasting disease. It was the starfish arms walking off on their own that alerted biologist Steven Fradkin that something was terribly wrong at Starfish Point at Olympic National Park. Next he noticed white lesions pitting the skin of the usually colorful orange, purple and brick-red starfish that are the signature of Olympic tide pools. Worse, the starfish, usually so thick and clinging robustly to their rock, were melting into goo. The observations he made and shared June 7, 2013, would turn out to be the first reported sighting of a mysterious starfish wasting disease that in 2013 and 2014 would devastate more than 20 species of starfish from Alaska to Mexico. In its geographic scope, the number of species of starfish affected, and duration of the outbreak — still not over — the sea star wasting syndrome Fradkin first documented is now understood to be the largest observed die-off of a wild animal in the ocean. Nearly three years later, the epidemic of sea star wasting disease has left many coves, tide pools, pilings and beaches still largely bereft of starfish. Some locations saw complete mortality of sea stars. Scientists working ever since to understand the outbreak have published the first evidence of a link between warmer ocean temperatures and the devastation of the wasting disease. Unusually warm ocean temperatures coincided with the 2014 die-off analyzed in the paper published last week in the Philosophical Transactions of the Royal Society. The scientists also figured out why so few sick juvenile sea stars were being seen that summer: While younger sea stars took longer to show symptoms, once they did, they died right away. 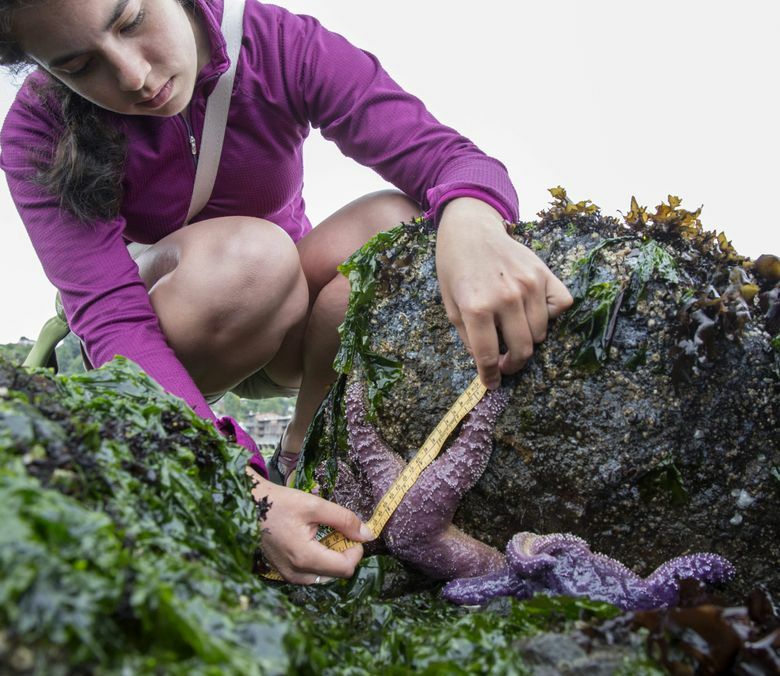 Scientists focused on the most abundant species on the West Coast, Pisaster, the ochre star. The wasting syndrome was linked to a virus and resulted in rapid disease spread, high death rates, and wasting that continued in survivors in 2015. Prevalence of the disease was as high as 100 percent in some locations studied, with an overall mean of 61 percent prevalence at the 16 total study sites in the San Juan Islands, South Puget Sound and Washington’s outer coast. Adult starfish were hit first — leading to a restructuring of communities with adult populations falling to 25 percent of pre-outbreak levels. The role of temperature was unmistakable. In lab experiments, the death rate of adult starfish was 18 percent higher in warmer water than infected stars in cooler tanks. Timing of the outbreak varied in different parts of the coast, noted Morgan Eisenlord, lead author on the paper. 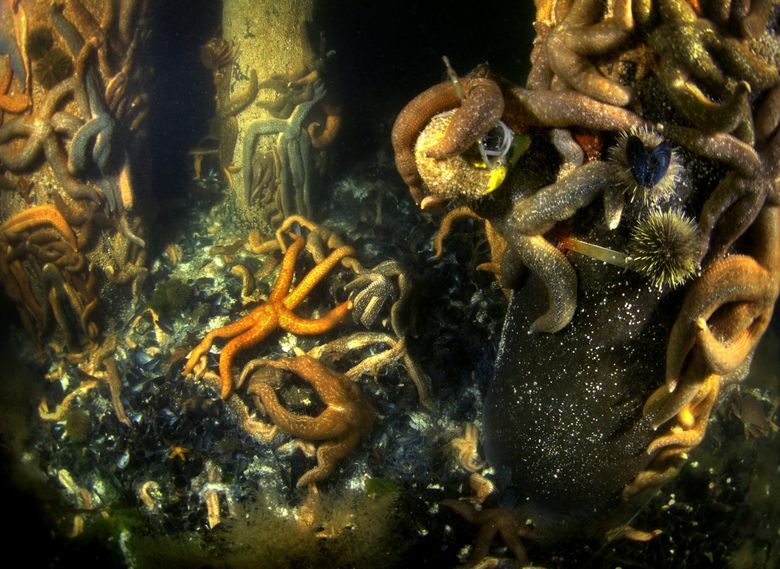 At first there was no sign of the disease in the San Juans — but then it spread to the point that 100 percent of the starfish in some coves died. “You would see more and more animals be affected to the point that you could see just the tissue where the animals used to be,” Einsenlord said. A warming ocean is a double whammy, Harvell notes. Warmer than usual water can stress animals, and also make infectious agents more virulent. With so much heat already baked into the climate system by human-caused climate warming, and sea surface temperatures on the rise nearly everywhere globally, more diseases will flourish. “A warmer world will be a sicker world,” Harvell said. It’s not just a starfish problem. 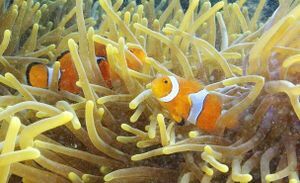 In another paper, scientists noted that a wide variety of marine animals, from sponges to corals to lobsters, turtles and bivalves are potentially at risk of disease in warmer ocean temperatures. That knowledge, though, also could allow managers to forecast outbreaks, increase surveillance for disease and implement preventive strategies, said Jeff Maynard, the primary author of that study. Both studies resulted from work done by members of the Cornell-based Ecology of Infectious Marine Diseases Research Coordination Network funded by a five-year National Science Foundation grant. Harvell said she doesn’t believe the outbreak is over. Last spring, she saw ochre sea stars at her study sites in the San Juans — 70 percent fewer than the previous year, but they looked pretty good. Yet half had died by last summer. Lesanna Lahner, veterinarian for the Seattle Aquarium, agreed. Juveniles she’s observed grow to about the size of a small dinner plate, then perish, Lahner said. Another question is the long-term effects of such a wallop to a species. Already some have seen changes in the coves they know well. Seattle diver Laura James has been tracking the waters off West Seattle since the outbreak started. First she saw the devastation of the disease. Now, she is seeing barren sand, rocks and pilings that used to be alive with colorful constellations of starfish. Elsewhere, such as at the West Seattle passenger-ferry dock, green urchins — prime food of the now absent starfish — arrived in droves, mowing down the algae and other vegetation. As important as the ecological effects of the disease are, the starfish meltdown affects people, too. The first ocean creature many kids see or touch, starfish are an ambassador to an unseen world that needs all the friends it can get, James said.